Bangkok (AP) - Thailand’s Parliament convened an emergency session Sunday at the request of the country’s embattled prime minister, who acknowledged that his administration cannot control spiraling anti-government protests. Prime Minister Samak Sundaravej remained defiant, despite asking Parliament for a helping hand as thousands of protesters remained camped out at his official compound for a sixth day. “I will not bow. I will not step down and I will not resign - despite the pressure mounting on my government,” Samak said during his weekly television program, just hours ahead of Sunday’s joint session of both parliamentary chambers. “Since the government cannot resolve the problem ... the joint session of Parliament is the best choice for finding a solution,” said Samak. A long, heated debate was expected with few predicting that Parliament, which is heavily weighted with Samak’s allies, could produce an immediate solution to the growing political crisis. Samak’s six-party coalition government controls more than two-thirds of the seats in the 480-seat lower house. Samak’s People’s Power Party said it plans to present a compromise in Parliament to appease anti-government protesters. But protest leaders say they will not back down until Samak resigns. The protest organizers, the People’s Alliance for Democracy, accuse Samak’s government of corruption and of serving as a proxy for ex-Prime Minister Thaksin Shinawatra, who was deposed in a 2006 coup. Thaksin was banned from public office until 2012 and recently fled to self-imposed exile in Britain to escape an array of corruption charges. Samak led Thaksin’s political allies to a December 2007 election victory, and their assumption of power triggered fears that Thaksin would make a political comeback on the strength of his continued popularity with Thailand’s rural majority. Protesters say that Western-style democracy has allowed corruption to flourish and they want a new government with a parliament in which most of the lawmakers are appointed and only 30 percent elected. Since Tuesday last week, protesters have been camped outside of the government’s headquarters, known as Government House, turning its once manicured grounds into a muddy mess of tents, portable toilets and piles of garbage. Samak received key backing Saturday from his six-party ruling coalition, which said it would not dissolve parliament to call new elections. More than 1,000 government supporters staged a counter-rally Sunday in front of Parliament, about a half-mile from Government House. The unrest peaked Friday when police fired tear gas to stop thousands of protesters from attacking the city’s police headquarters, which is near Government House. In other parts of the country, rail workers joined the protest by halting service on dozens of trains. Protesters forced airports to shut at some of the country’s most popular beach destinations. Phuket airport remained closed Sunday, with protesters blocking the runway for a third day. Authorities said they had no idea when flights would resume. Krabi airport reopened after a two-day closure. Samak had requested a Saturday meeting with Thailand’s revered King Bhumibol Adulyadej at his seaside palace in Hua Hin. There was no immediate confirmation from either Samak or the palace on whether the meeting took place. Bhumibol is a constitutional monarch with no formal political role, but he has repeatedly brought calm in times of turbulence during his 60 years on the throne. on the Chiang Mai-Lamphun Superhighway in Saraphi. A traffic accident during the evening rush hour on the Saraphi section of the Chiang Mai/Lamphun Superhighway between a truck delivering Pepsi, a Toyota Corolla and a pick-up truck resulted in two injuries and a large pool of the popular drink on the road. Police called to the scene found the six-wheeled truck on its side, with most of its cargo spilled onto the road, having crashed at high speed into the rear of the Toyota at red traffic lights. The impact had forced the Toyota to collide with a pick-up truck, causing considerable damage and a long tailback on the busy road. Rescue workers took the two injured to Rachaves Hospital. The driver of the delivery truck was arrested and charged with reckless driving resulting in injury and causing damage. Following the August 26 PAD riots in Bangkok, during which government buildings and the state-run NBT television station were occupied by armed protestors, uniformed and plain-clothes police were sent to Chiang Mai’s NBT station. After reports that over 3,000 PAD protestors from northern Thailand had joined the Bangkok protestors, it was feared that violence could also erupt within Chiang Mai. The entrances to the TV station, the Region 3 PR Bureau in the NBT building, and the Thailand Radio station were placed under police control, as was an anti-PAD protest held at the Grand Warorot Hotel. Chiang Mai Town Hall and the area in and around Wararot market also attracted police patrols, and employees in all sectors were advised to be on the alert. At the time of writing, the situation in both the city and the northern areas appears to be normal. Heavy rain in Thung Cahng district, Nan province, caused a flash flood in the immediate area of a weir on a local river, sweeping two villagers to their deaths. A group of 10 villagers including the victims had been returning from work in fields close to the weir when the flash flood occurred. The two were swept away and drowned. A search was immediately begun; late on the same evening when the flood waters had receded, the body of Wong Toburin, 50, was found jammed against the wall of a small dam over 1 km away, which had also been damaged by the flood. The body of Kaesorn Nichasin has not yet been found. 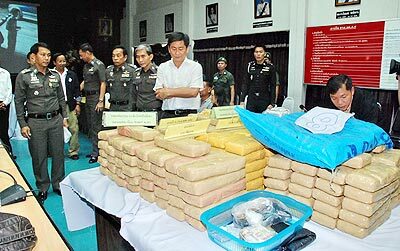 Pictured is the huge haul of 1.7 million YaBa pills piled up in front of the 5 gang members at the press conference held after their arrest. A major cross-border player in the drugs game has escaped arrest after being forewarned by fellow-criminals of a police raid on his property in Mae Sai. Mana, 38, a member of the Lahu hill tribe, also known as Na Mae Rai, was implicated by 5 accused gang members during questioning, who alleged that he was the leader of a major YaBa smuggling ring. Mana had been working with a cross-border supplier and had stored large quantities of Yaba pills at a house in Chiang Rai belonging to Prasong Srikan and Tib Satcha prior to its delivery to a customer in Lop Buri. On receiving his details, local police had gone to Mana’s house with an arrest warrant, only to find that, according to witnesses, the drugs baron had fled in his car after receiving a warning of his imminent arrest. It is believed that he has most likely crossed the Thai border to hide in Burma. Later, police tracked down and seized his assets, including land, a house and a restaurant, together worth approximately 20 million baht. During a search of the properties, a stash of 1,714,000 YaBa pills were found and seized as evidence. The search for Mana will continue on the Thai side of the border. An unusual symposium was held last week at Chiang Mai’s Botanic Resort last Tuesday, hosted by the Thai Ministry of Natural Resources and marking the occasion of Her Majesty Queen Sirikit’s 76th birthday. The 4 day international firefly symposium attracted over 100 entomologists and enthusiast from around the world, and is the first to have ever been held on these insects. Adam South, a biologist from Tufts University, Massachusetts, and a recognised expert on firefly spermatophores, (penises), admitted that there is a great deal that remains unknown about the more than 2,000 species of fireflies, including their reproductive methods and the mechanisms that control their “flash”, created by the enzyme luciferase being broken down by nitrous oxide and oxygen. Fireflies have been the subject of independent studies by scientists for many years to determine whether the “flash” has either medicinal or industrial uses, and environmentalists regard the flying beetle as an index of environmental health. In Bangkok, along the banks of the Chao Phraya River, abundant displays of fireflies were common until, during the last 20-30 years, pollution and deforestation destroyed their natural habitat. There are approximately 55 known species in Thailand, including Luciola aquatilis, which was discovered last year by Anchana Thancharoen, an entomologist at Kasesart University, whose recent studies indicate that, on mating, the rate of the “flash” gradually accelerates during the three to five hours of the process. HM Queen Sirikit, well know for her environmental concerns and projects, donated 2 million baht in 1996 to scientists studying fireflies in Thailand as an indicator if environmental health. A young musician, whose locked motorcycle had been stolen from outside his apartment two months previously, had a pleasant surprise recently when, due to the recent arrest of a motorcycle theft gang by Chiang Mai police, his treasured machine was returned. The gang, 7 youngsters aged between 16 and 20 years old, led by a 19 year old student, confessed when questioned to having stolen at least 50 motorcycles. The leader also informed police that there were at least 4 more such gangs operating within the province. It would seem that the gangs operate mainly at night, driving a pick-up truck and targeting groups of motorcycles parked outside apartment blocks, hoisting them onto the truck and driving away. Police estimate that at least 400 machines have been stolen in the last three months, an average of 3-4 daily. They have only been able to recover fewer than 40. 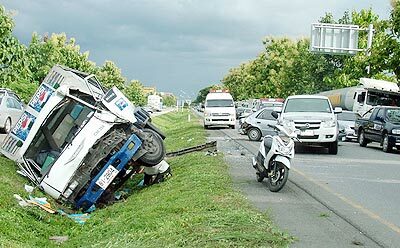 The Deputy Commander of Chiang Mai Provincial Police, Pol. Col. Panudej Boonrueang, said, “Motorcycle thieves work for a syndicate. They steal motorcycles and others are hired to ride them to border areas. Other gang members contact buyers in neighbouring countries to pick up the goods. A major motorcycle theft syndicate will send stolen motorcycles to neighbouring countries at a cost of less than 10,000 baht each”. The Governor of Chiang Mai, Wibun Sa-nguanphong, has announced a programme of government directed community events to be held during the 116 days between Mothers Day and Fathers Day in honour of HM King Bhumibol and HM Queen Sirikit. The events will run throughout the kingdom until December 5, with the opening ceremony having been held at Government House in Bangkok August 30, presided over by His Royal Highness Crown Prince Maha Vajiralongkorn and Princess Srirasmi, who presented flags representing the project to all provincial governors. Yesterday, September 1, a Royal Flag marathon was held at Thapae Gate in honour of Their Majesties, and ministerial organisations have been instructed to put together events which will encourage the promotion of national unity. Wristbands will be for sale through out the city for 159 baht; the profits after expenses from which will be donated to the Royal Satellite Television Foundation, one of the Royal charitable projects. The family of an American tourist murdered in Chiang Mai earlier this year have called on fellow Americans to boycott Thailand as a tourist destination. The murdered man’s mother, Sandra Fall, said that she could not even celebrate the guilty verdict as she had lost a son, whose killer would soon be free to walk the streets. She pleaded, “Let all Americans know that they are not safe, and will not be given justice”, and continued, “The Thai and the United States governments should be ashamed of themselves - Americans should be alerted to avoid countries that treat them like dirt”. Gary’s sister and cousin have written to former US presidential candidate John Kerry, and to senior democrat Ted Kennedy protesting against Douglas’s sentence. The aftermath of Cyclone Nargis and the deepening humanitarian crisis in Burma has resulted in a boom in the profits of people smugglers who illegally transport migrant workers across the Thai border. Reports from the Irrawaddy delta suggest that, although basic initial aid seems to have reached most areas, food supplies are still at crisis point and victims are still struggling to recover at a time when many local NGOs and volunteers are leaving the area. The closing of the UN Food Agency’s Don Muang Airport hub and the downsizing of its fleet of emergency supply distribution helicopters from 10 to 2 may also mean that far fewer essential supplies reach the far flung areas of the delta. It is estimated that at least 300 illegal workers are smuggled across the border daily, adding to more than a million Burmese migrants already in the kingdom, only 500,000 of whom re registered with the Ministry of Labour. Crossing points include Mae Sai, Mae Sot and the Three Pagodas Pass near Sangkhlaburi. The dangers of such a journey were highlighted recently when 54 migrant were found dead in a truck bound for Phuket. Efforts by the Thai border authorities to stem the tide seem to have been unsuccessful, but a recent crackdown by the Burmese authorities is reducing the numbers who cross successfully. Human traffickers are charging approximately 12,000 to 14,000 baht per person per trip with no guarantee of work on arrival. In the Kam Thieng area of Chiang Mai, hundreds of Burmese migrant workers can be seen every morning queuing for jobs in the construction and agricultural industries. Due to the recent economic downturn, many are unsuccessful. “Withdrawal Symptoms” by Trans-National Institute’s Drugs and Democracy Programme presents several arguments to back up its point. These include a lack of alternative sources of income and food for ex-opium producing farmers; the shifting of cultivation from traditional growing areas to new localities, (for example, from Wa and Kokang to Southern and Eastern Shan State in Burma), the continuing conflict in Burma; investment in poppy cultivation from Thailand and China and the policy of the Burmese army for its field units to be responsible for raising their own funds. Both Burma and Laos score the worst poverty index in the region and the traditional poppy regions in these countries are the worst off of all areas. Current levels of assistance to offset the impact of the opium ban are woefully insufficient because of lack of initial investment capital and the transformation of available arable land for commercial purposes by governments whose policy interventions are wrongly sequenced. It has also urged full respect for human rights, adherence to democratic principles and provision of space for local organizations to represent their rights meaningfully. “It is clear that without good governance, no sustainable solution for drug-related problems is possible,” it says. TNI, founded in 1974, is based in Amsterdam; its Drugs and Democracy Programme has already published a number of debate papers on the subject. The authors of Withdrawal Symptoms, Martin Jelsma and Tom Kramer, can be reached at Email: [email protected] tni.org and www. tni.org/drugs.